Recently, I bought a semi-professional #7 jointer plane, which doesn't mean much by my country standards, since we get Chinese rip-offs that are sold under famous brand names (and prices). Nevertheless, it was the best I could get and afford. Naturally, this jointer needs a lot of work before it can be used. One of the sides is at a perfect 90° to the sole, however, the other one is at about 87° to the sole (meaning that the sides are not parallel). If I'll ever have to use it on shooting board, I'll use the good side. However, the big problem is that the sole is nowhere near flat. The shape is concave along the length, and somewhat across too. I have a calibrated granite block, so I placed some 60 grit sandpaper on it, crossed the sole with marker, and then started "planing". After 5 hours (not exaggerating) of sanding, I gave up, because I'm nowhere even close to flattening it - there's just way too much material to remove. Here are the photos of the progress of flattening, taken about once every hour. 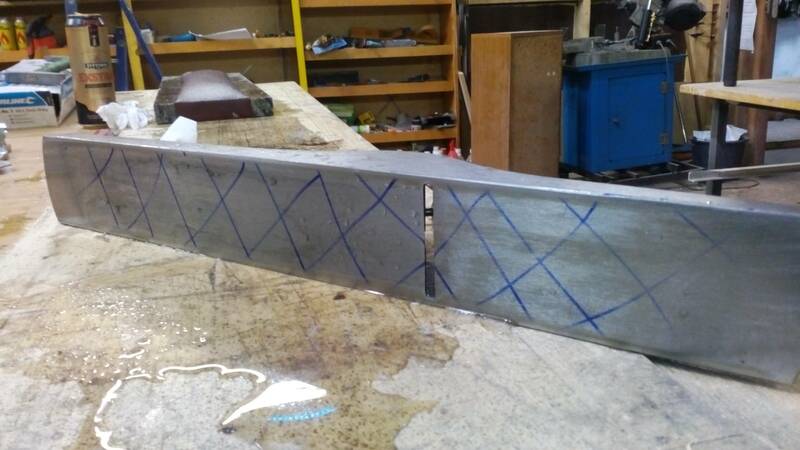 As you can see, at first, the progress was good, but as I went on, the contact surface increased, meaning there's more and more steel to grind. By the end, I realized this is going to take forever, likely longer than that. 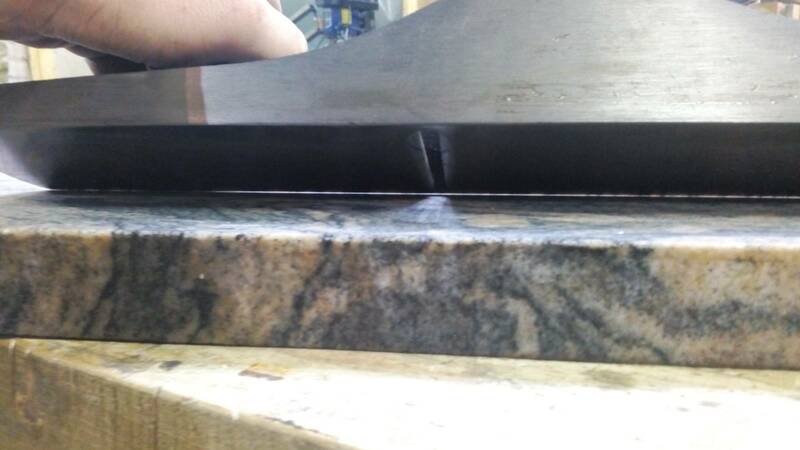 Even though the marker pattern indicates that the ends and the sides of the sole have been flattened, placing the jointer against flat granite revealed that the ends are still way too high. I have no idea why the sandpaper didn't fix the ends - maybe it isn't pressed against granite well enough, springs up, and follows the concave shape of the sole? Filing and scraping are the traditional ways to flatten a cast iron surface by hand. These processes will be significantly faster than "sanding" on a surface plate. Done well, a scraped surface can easily be within .001" flatness and even .0001". I also find scraping really satisfying, although I'm glad I don't need to do it to pay the bills (it takes time). 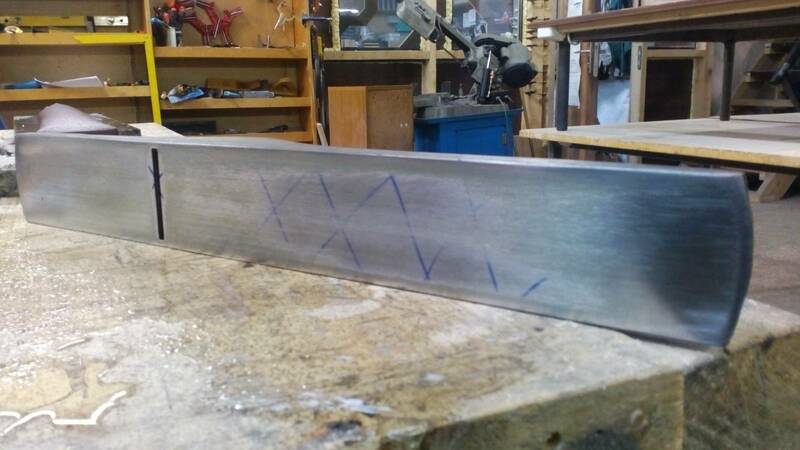 The rough idea is that you spread marking medium, like Dykem Hi-Spot Blue in a thin layer on the surface plate, rub the surface on that, and then scrape off all the areas that marked blue (the "high" spots). You do this over and over until it all marks blue. Hand Scraping - How I do it. There are several others if you search on "metal scraping". A scraper that kind of works can be fashioned from a file, but something with at least high-speed steel on the cutting edge is much more effective. The edge is sharpened at a 95 degree included angle (negative rake), which may seem a bit odd at first. 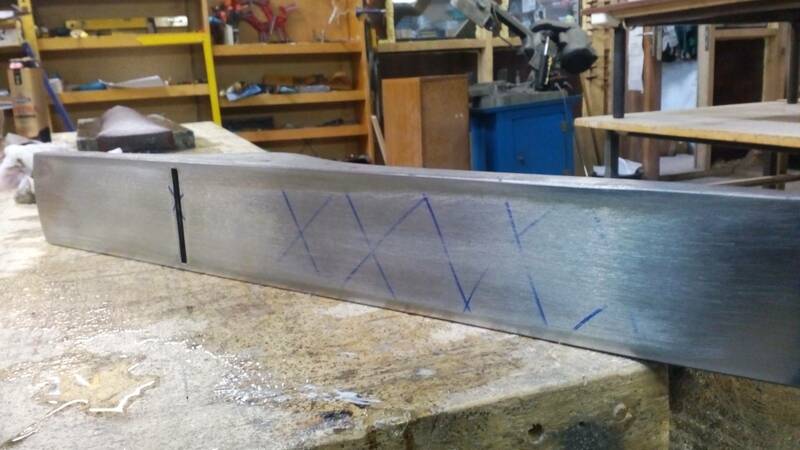 A file may be used for roughing. Alignment is a problem with filing and it's very, very easy to round over the part (sole in this case). So be careful if you choose this option. 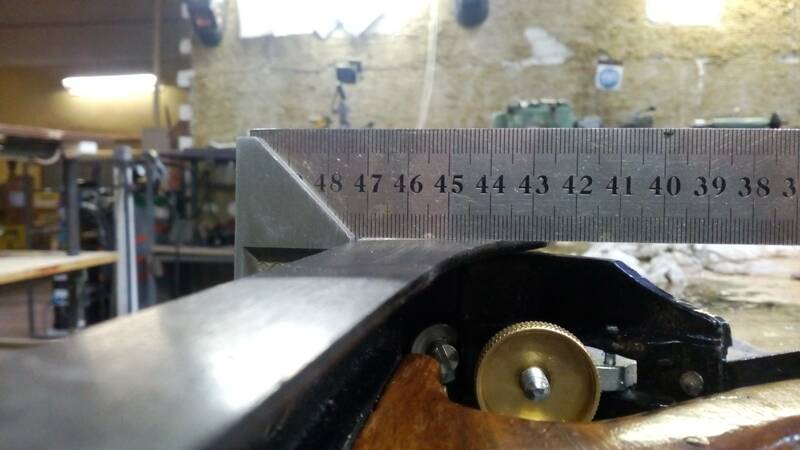 By the way, assessing bottom flatness by tipping the sole onto an edge, as you do in the last picture, is only valid if that far side is perfectly flat. The bluing/transfer-marking approach will give you more reliable indication, or you can slip feeler gauges underneath while it's sitting on the surface plate. Having a friend who previously owned a machine shop gave me a slightly different perspective on this question. I checked The Google and found that my thought isn't all that far "out there." 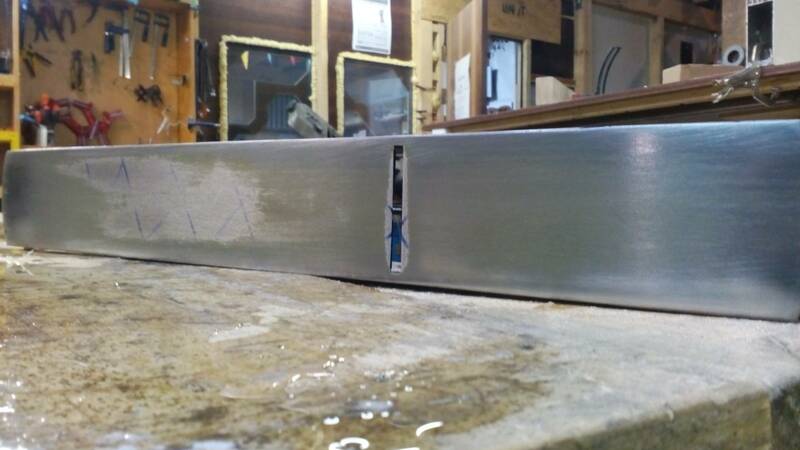 Someone in the above link has posted that he had a machine shop use a surface grinder on his plane to get to within 0.01" of flat, as well as squaring the sides. There's some discussion about performing the grinding with or without the frog plate and blade in place, but that seems to be personal opinion with a bit of anecdotal evidence. If you have a small job shop in your area, you may find a shop owner willing to take on your task for a reasonable fee. My friend would have been shooting for better than 0.01" as he typically managed 0.0005" for his CNC stuff.